You can easily remove calculated fields and items from an Excel pivot table. To remove a calculated field, click a cell in the pivot table. Then click the Analyze tab’s Fields, Items & Sets command and choose Calculated Field from the submenu that appears. When Excel displays the Insert Calculated Field dialog box, select the calculated field that you want to remove from the Name list box. Then click the Delete button. Excel removes the calculated field. 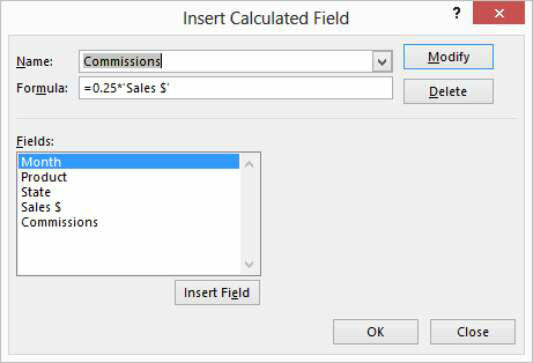 In Excel 2007 or Excel 2010, click the PivotTable Tools Options tab’s Formulas command and choose Calculated Field from the Formulas submenu to display the Insert Calculated Field dialog box. Click the button of the calculated item that you want to remove. 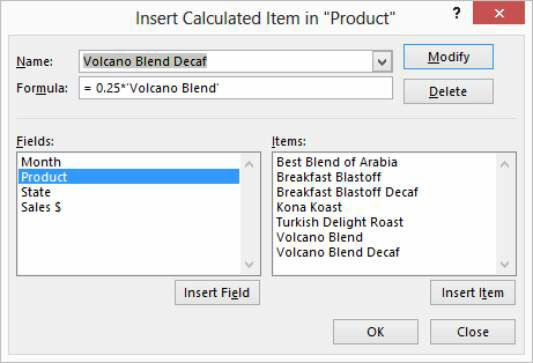 For example, if you want to remove the Volcano Blend Decaf item from the pivot table, click the Product button. Click the Analyze tab’s Fields, Items 7 Settings button and then click Calculated Item from the menu that appears. The Insert Calculated Item dialog box appears. In Excel 2007 or Excel 2010, you click the Options tab’s Formulas button and then choose Calculated Item from the menu in order to display the Insert Calculated Item dialog box. Select the calculated item from the Name list box that you want to delete.